Most of your child’s development will have already been built by the time you sit down for your first parent/teacher conference. We are addressing this critical gap between parents and educators through our innovative community program, P. E. A. C. E. (Parent Education And Child Empowerment). Our team of highly-qualified facilitators are rigorously trained in child development and Montessori Education to provide you with the guidance you are looking for to help your child reach their potential. Our programs range from group to individual formats and are located at schools, community centers and even in your own home to give you the personalized support you need. We are there when you need us and help connect you to other local parents so you can broaden your essential network of support. I love the entire set up. Parents get to share their experiences and we have an expert that has extra tips if needed. I also like that the children are free to explore each other and their surroundings. I know a fair bit about child development because of my job but I really appreciated the practical advice and I feel it will help me be a more effective parent. We implemented a few things and I cannot believe how capable our daughter is at this age. These small(ish) changes have a large impact on our parenting and will forever foster her growth, development, and self worth. Baby & Me is a drop-in parent support group for non-walking infants 0-12 months. Come play in our play space and join our small group conversation about all things baby: sleep, starting solids, toys, and more! Parent Workshops are interactive classes for parents about child development from 1-6 years. Come talk about limit-setting, sharing, independence, and get practical tips for your every day questions. Home Visits are personalized consultations in your home about setting up your spaces for each developmental stage and talking through your more pressing parenting challenges. Baby & Me is a support group for parents or caregivers and their 0-12 month non-walking infants. Expecting families are also encouraged to attend. 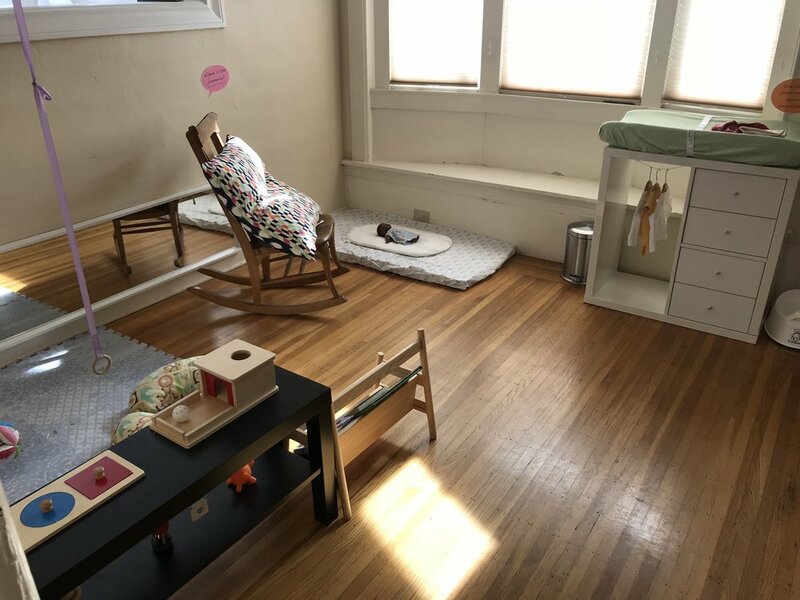 In this group, babies can play in a developmentally-aligned Montessori play space and ask questions about parenting, Montessori, and child development. Our facilitator, Mariana Bissonnette, is an AMI 0-6 trained educator and parent of two! Attendees have access to sponsored PEACE home visits for babies up to 12 months.